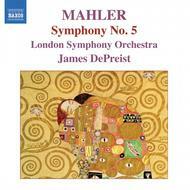 Mahler’s Fifth Symphony, a work of huge emotional and structural range, was his first purely orchestral work since the First Symphony of 1888, and his first orchestral work to dispense with both the human voice and overtly programmatic elements. He completed Symphony No. 5 in 1902 during the summer following his marriage to Alma Schindler. The second most recorded of Mahler’s symphonies, Symphony No. 5 includes the ravishing Adagietto, a love-poem for the beautiful Alma Schindler, his future wife, and subsequently made famous by its use in Visconti’s film Death in Venice.